AFTER Bengal and Tripura, Barak Valley in Assam is another abode of the Bengalis in India. 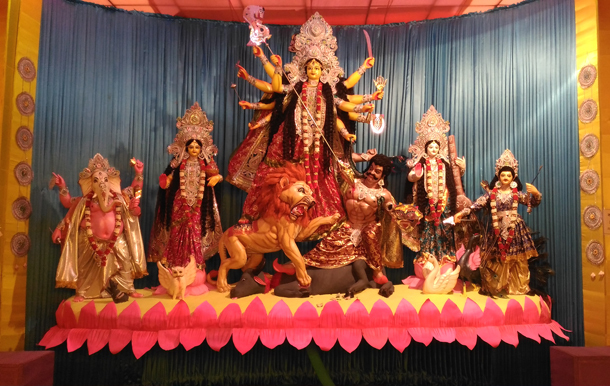 And like all places inhabited by the Bengalis, here too Durga Puja is the main festival. 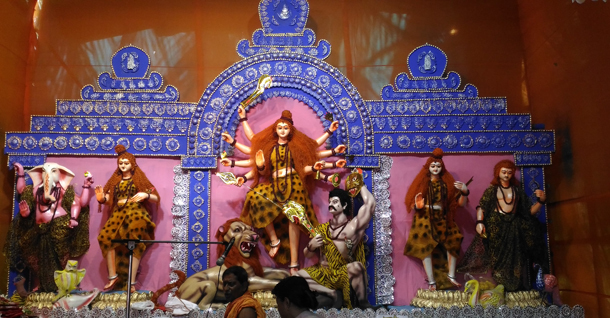 In Silchar, the hub of Barak Valley, the history of Durga Puja is over 200 years old. 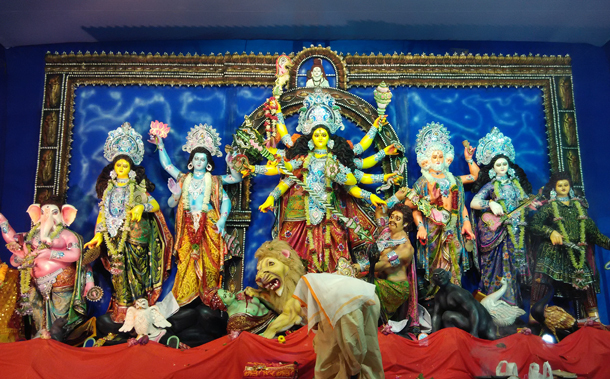 The town is dotted with hundreds of community Durga Pujas; there are a few household Durga Puja too ~ the prominent one being at the house of erstwhile zamindar Baroda Kanta Das at Purna Pal Road. 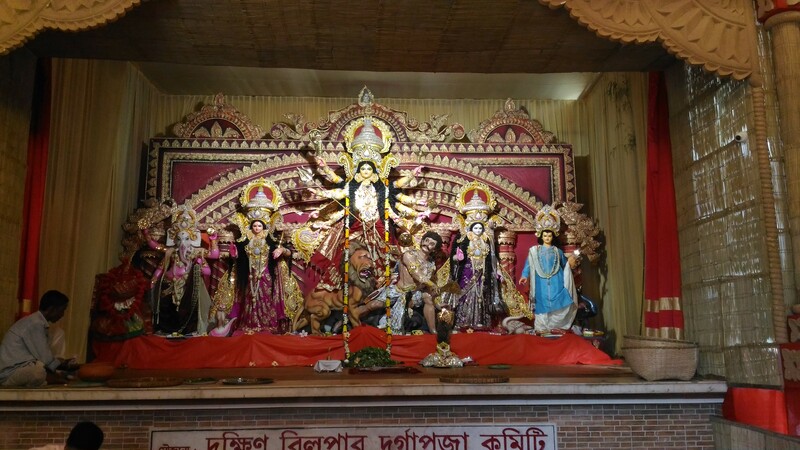 We present below a photo tour of the select community Durga Pujas in Silchar with their uniqueness being explained in the caption. 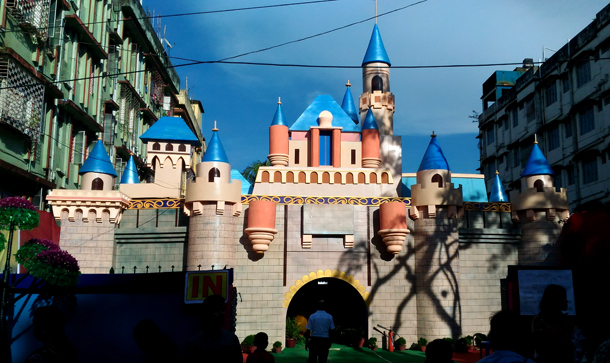 PASCHIM AMBICAPUR (AMBICAPATTY DURGA SHANKAR PATHSALA): THIS PANDAL LOCATED IN THE NEIGHBOURHOOD OF ASSAM ASSEMBLY’S DEPUTY SPEAKER AND BJP MLA DILIP PAL DEPICTS THE DISNEY WORLD. INSIDE THE PANDAL IS A FOUNTAIN WITH ARTIFICIALLY PUMPED IN SURF THAT HAS PROVED A MAJOR DRAW FOR THE KIDS. 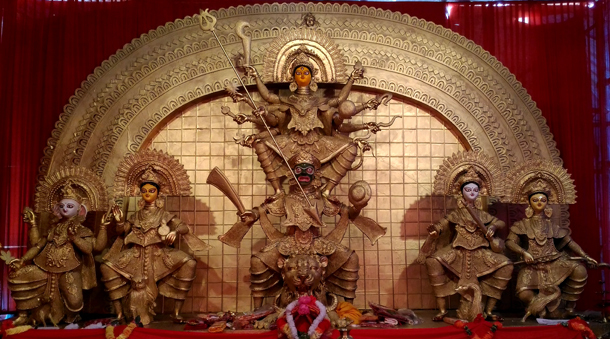 PASCHIM AMBICAPUR (AMBICAPATTY DURGA SHANKAR PATHSALA): THE IDOL, MADE OF PAPER MACHE, SITS ON A LOTUS. IT IS DIFFICULT TO REALISE THAT IT IS NOT MADE OF CLAY TILL YOU TOUCH. 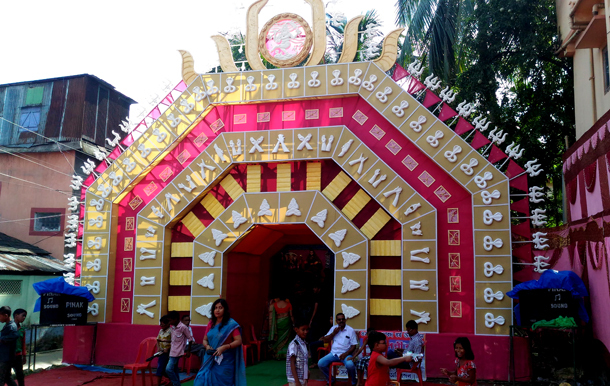 SONAI ROAD TARUN CLUB: OVERALL THE BEST THEME PANDAL IN SILCHAR THIS YEAR. 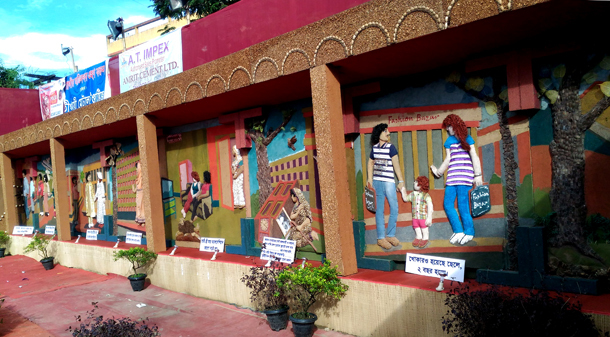 HERE THE PANDAL DEPICTS THE HARDSHIP THAT PARENTS UNDERTAKE IN RAISING THEIR CHILDREN AND IN CONTRAST THE ILL TREATMENT OR NEGLIGENCE THAT THE CHILDREN GIVEN THEM IN RETURN ON GROWING UP. 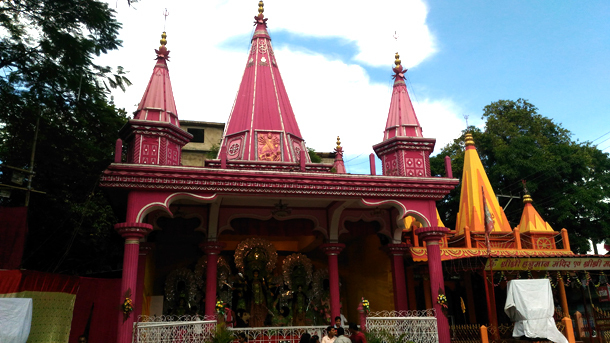 THE PANDAL HAS BEEN MADE WITH WOOD DUST, DRY FLOWER PETALS, FRUIT SEEDS ETC. 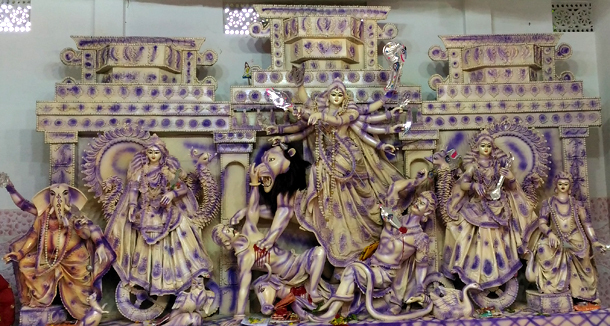 SONAI ROAD TARUN CLUB: THE PANDAL PREMISES PRESENT THE HARDSHIP OF THE PARENTS IN THE FORM OF CLAY ART. SONAI ROAD TARUN CLUB: THE PANDAL PREMISES ALSO NARRATE THE INDIFFERENCE THAT GROWN UP CHILDREN OFFER THEIR PARENTS, EVEN OFTEN FORCING THEM TO LIVE IN OLD AGE HOMES. 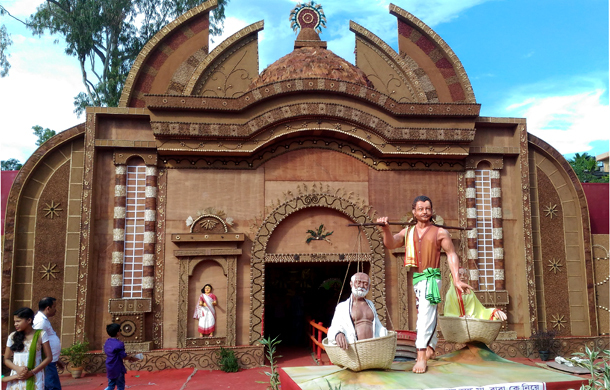 SONAI ROAD TARUN CLUB: THE CLAY IDOL OF SHRAVAN KUMAR CARRYING HIS BLIND PARENTS ON SHOULDER FOR A PILGRIMAGE HAS BEEN PLACED AT THE CENTRE OF THE PANDAL PREMISES TO REMIND THE PRESENT GENERATION OF THE INDIAN VALUES ABOUT CARING FOR AGED AND AILING PARENTS. 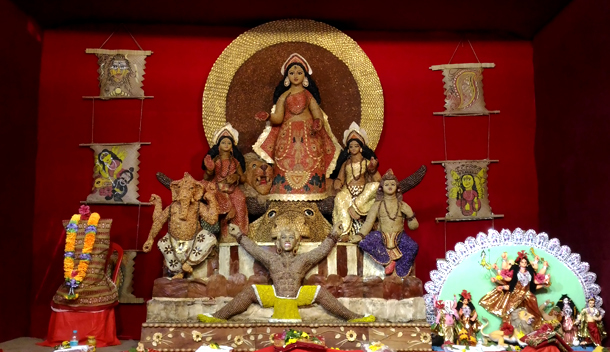 SONAI ROAD TARUN CLUB: THE IDOL IS MADE UP OF FRUIT SEEDS, DRY FLOWER PETALS, PLUSES, AND HUSK. 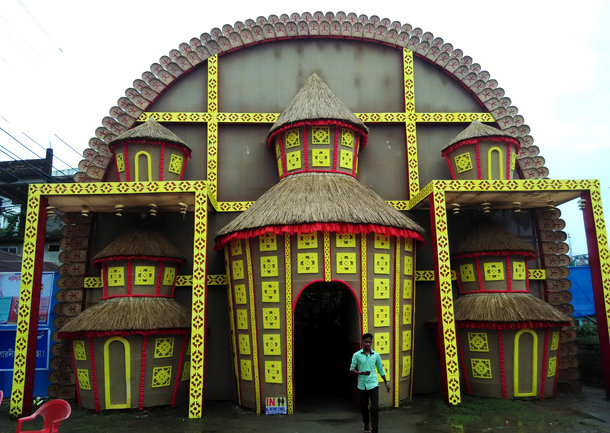 TARAPUR RICE MILL: THE PANDAL HAS BEEN THEMED ON A BUDDHIST MONASTERY. THE CRAFTSMANSHIP IS SO SUPERB THAT AT THE FIRST GLANCE IT APPEARS LIKE A REAL ONE. TARAPUR RICE MILL: THE IDOL IS ANOTHER PIECE OF INNOVATIVE WORK AND IS MODELED ON CHHAU DANCERS OF PURULIA IN BENGAL. 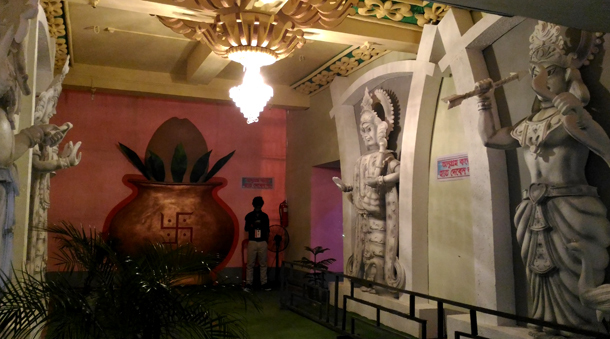 THE INTERIOR OF THE PANDAL ALSO HAS POSTERS NARRATING THE PAST AND PRESENT OF CHHAU DANCE. 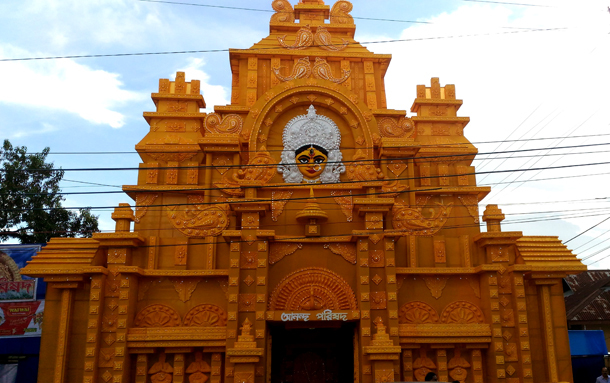 ASHRAM ROAD SARBOJANIN: THE IDOL 4O FEET IDOL MADE OF THERMOCOL IS THE PRIME ATTRACTION OF THIS PANDAL. SILCHAR’S NOTED ARTIST BACCHU DAS HAS CONCEIVED THE THEME AND HAS CRAFTED THE IDOL. 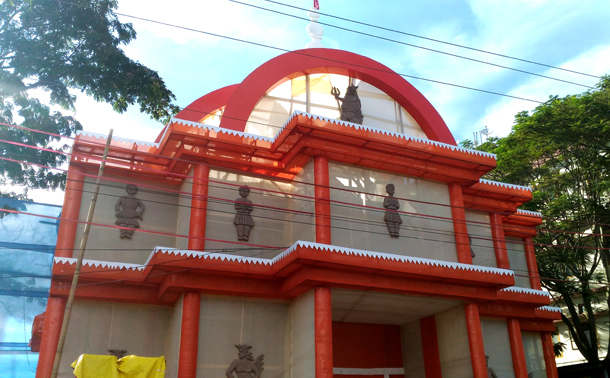 ASHRAM ROAD SARBOJANIN: INSIDE, ON THE RIGHT HAND OF THE PANDAL, THERE ARE LARGE THERMOCOL IDOLS OF KARTIK AND SARASWATI. 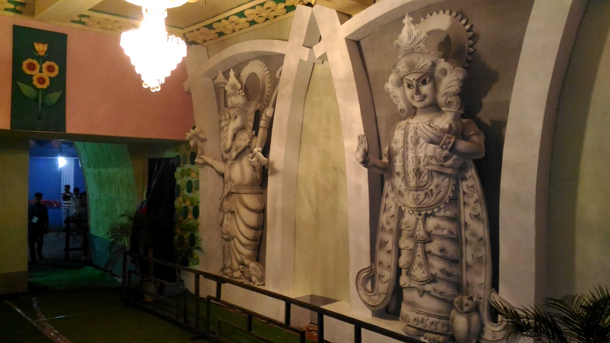 ASHRAM ROAD SARBOJANIN: INSIDE, ON THE LEFT HAND OF THE PANDAL, THERE ARE LARGE THERMOCOL IDOLS OF LAXMI AND GANESH. 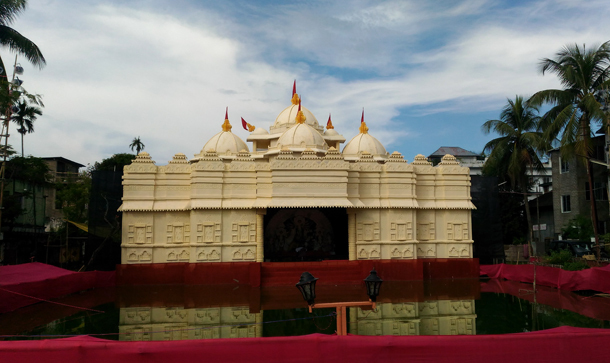 MANDIR DIGHI (BILPAR): THE PANADL HAS BEEN ERECTED AT THE CENTRE OF THE NATURAL LAKE WHICH IS A LANDMARK IN THE AREA. 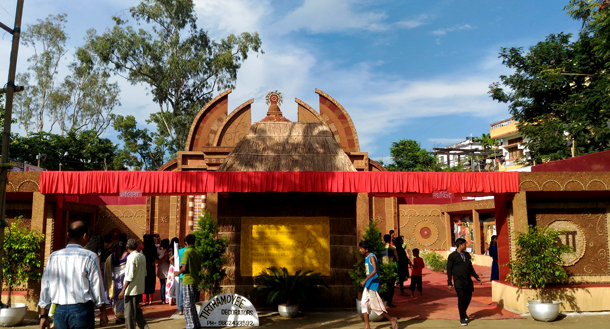 VISITORS CAN NOT STEP INTO THE PANDAL BUT THE VIEW FROM THE SPRAWLING FRONT YARD IS MESMERIZING ENOUGH. 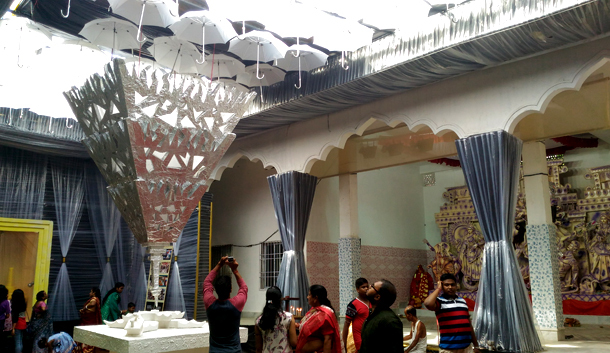 BILPAR (TERAPANTH YUVAK SANGHA): THE PANDAL IS MADE OF RUNNING PLASTIC SHEETS AND UMBRELLA. 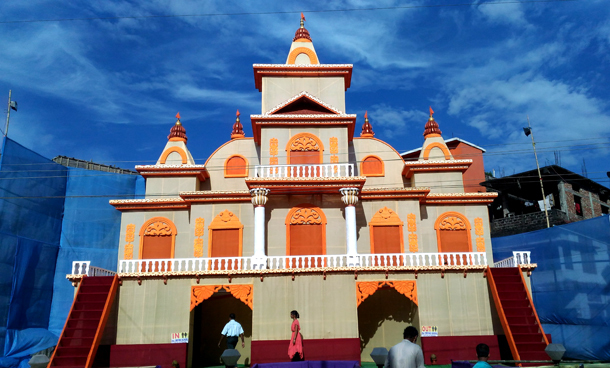 BILPAR (TERAPANTH YUVAK SANGHA): INTERIOR OF THE PANDAL HAS PROVED A HUGE CROWD PULLER. 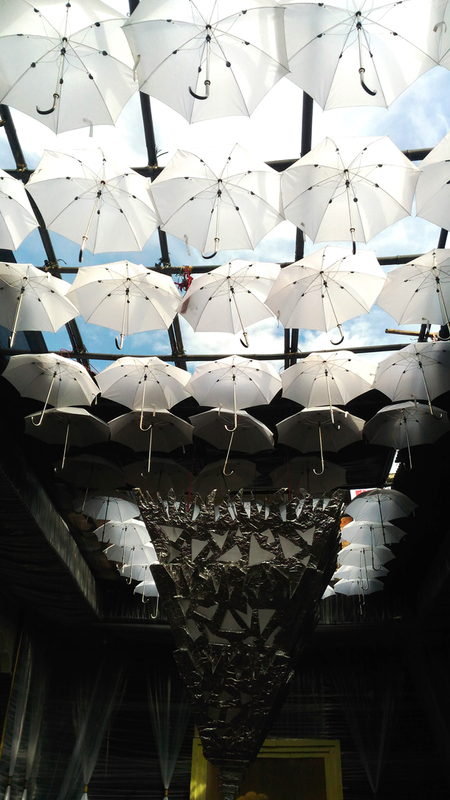 BILPAR (TERAPANTH YUVAK SANGHA): THE ROOF HAS BEEN DONE BEAUTIFULLY WITH WHITE UMBRELLAS. BILPAR (TERAPANTH YUVAK SANGHA): THE INNOVATIVE IDOL IS AN EYE CATCHER. 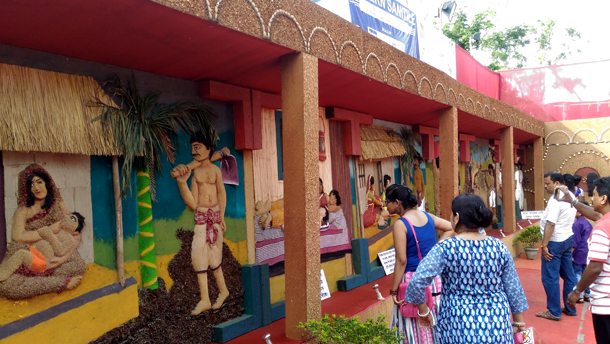 PUBLIC SCHOOL ROAD (SOUTH BILPAR): THE ENTIRE PANDAL HAS BEEN BUILT USING NATURAL STRAW, WHICH 100 PER CENT ENVIRONMENT FRIENDLY. PUBLIC SCHOOL ROAD (SOUTH BILPAR): CRAFTSMANSHIP AND ILLUMINATION IS SOMETHING TO MARVEL. PUBLIC SCHOOL ROAD (SOUTH BILPAR): THE IDOL HAS A TRADITIONAL LOOK. 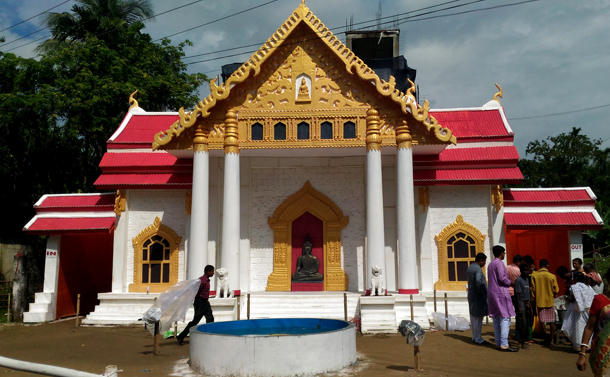 TARAPUR KALIMOHAN ROAD: THIS SIMPLE BUT EYE-CATCHING PANDAL IS LOCATED NEXT TO THE RESIDENCE OF FORMER UNION MINISTER SANTOSH MOHAN DEB AND HIS CONGRESS MP DAUGHTER SUSHMITA DEB. 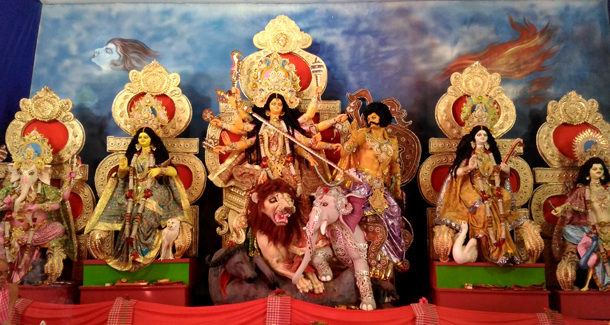 THE DEB FAMILY HAS ALL ALONG BEEN ASSOCIATED WITH THIS PUJA FOR DECADES NOW. TARAPUR KALIMOHAN ROAD: THE IDOL IS A BLEND OF BOTH TRADITIONAL AND MODERN LOOK. PRATHAM PALLY CLUB TARAPUR: SMALL BUT BEAUTIFUL PANDAL MADE OF CLOTH AND THERMOCOL. PRATHAM PALLY TARAPUR: THE IDOL HERE DEPICTS THE NATARAJ LOOK. 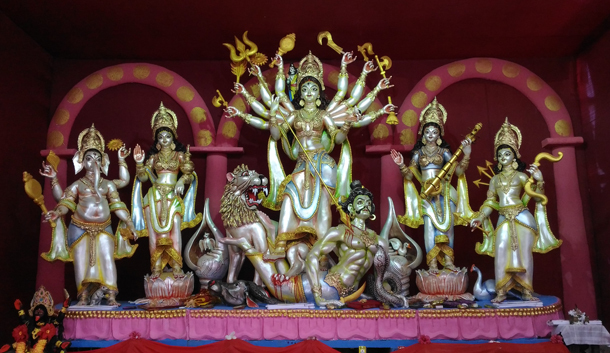 TARAPUR MOTOR STAND: ONE HAS TO CLIMB A SHORT STAIRS TO REACH THE PANDAL WHERE THE IDOLS OF DURGA AND HER ENTOURAGE STAND SEPARATE FROM EACH OTHER. 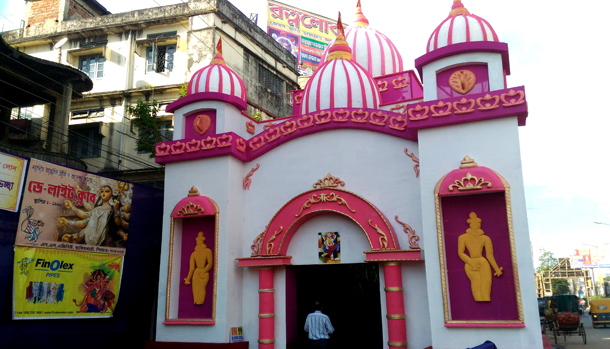 ANANDA PARISHAD TARAPUR: THIS IS ONE OF THE OLDEST DURGA PUJAS IN SILCHAR AND IS NONE FOR AESTHETICS. INTERIOR OF THE PANDAL ADORNS POSTERS PAYING TRIBUTE TO MARTYRS FROM THE ARMED FORCES. ANANDA PARISHAD TARAPUR: THE TRADITIONAL IDOL IS AN EYE-SOOTHER. 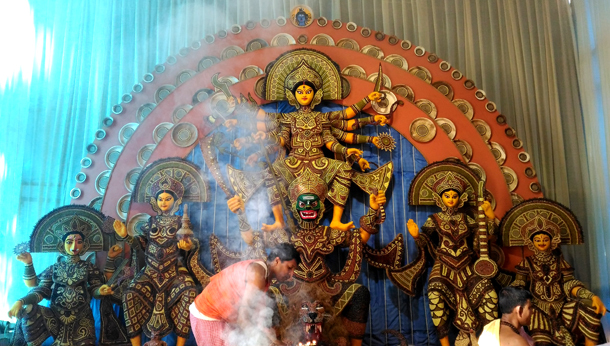 ITKHOLA DURGA BARI: THIS PUJA HAS ENTERED INTO ITS 104TH YEAR. 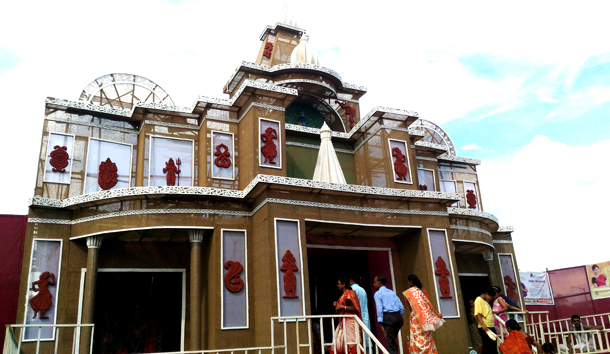 THE PANDAL IS A PERMANENT ONE. 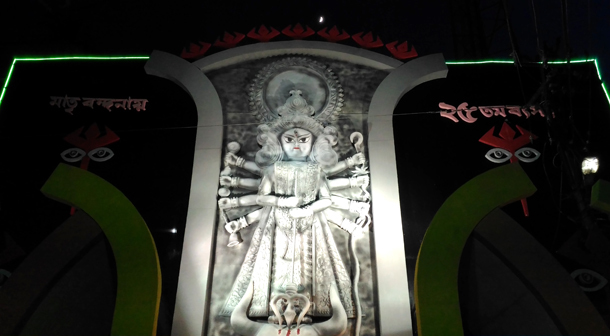 ITKHOLA DURGA BARI: THE 10 FEET DURGA IDOL HERE WEARS TRADITIONAL LOOK. 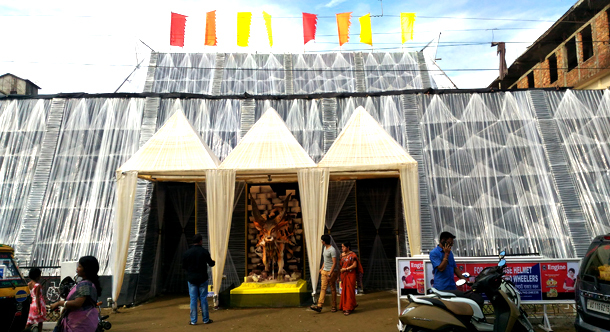 MADHYA SAHAR NARSINGTALA: THE PANDAL MADE OF HAY, BAMBOO, THERMOCOL IS AN EYE-GRABBER. MADHYA SAHAR NARSINGTALA: THE IDOL HAS A TRADITIONAL LOOK. 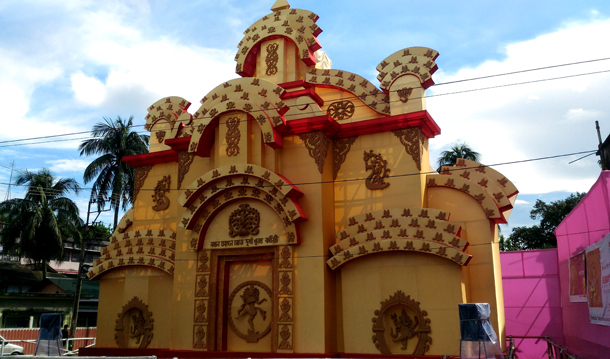 MEDICAL SALES PEOPLE PUJA HAILAKANDI ROAD (BT COLLEGE): THE PANDAL IS OF SIMPLE LOOK BUT THE ATTRACTION IS THE IDOL. 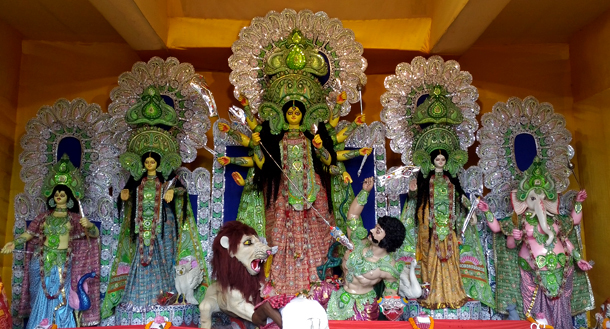 MEDICAL SALES PEOPLE PUJA HAILAKANDI ROAD (BT COLLEGE): THE IDOL HAS BEEN BUILT USING SEEDS OF VARIOUS FRUITS AND VEGETABLES. 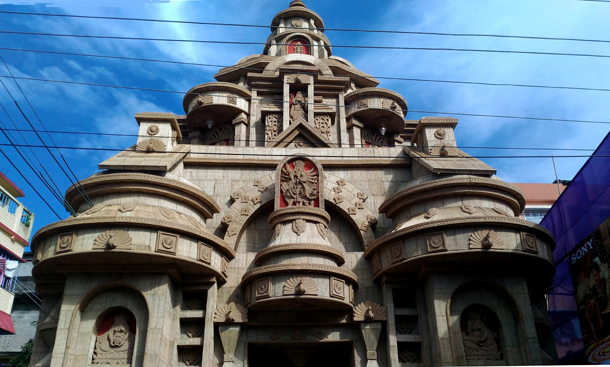 RAKHI SANGHA SONAI ROAD: THE TALL BRIGHT PANDAL GENERATES A SPONTANEOUS ATTRACTION. 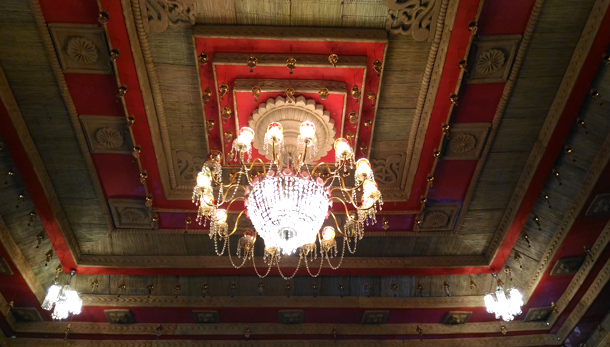 RAKHI SANGHA SONAI ROAD: THE INTERIOR IS FASCINATING. 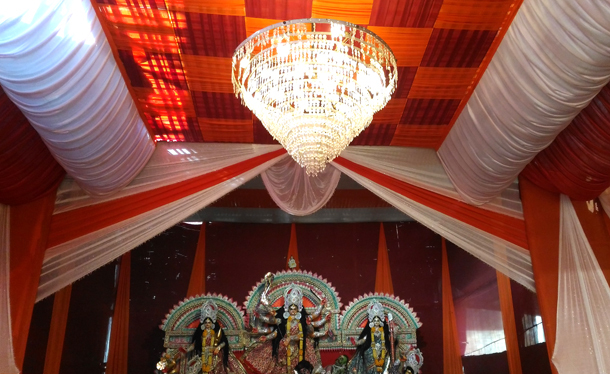 DAY LIGHT CLUB RANGIRKHARI: THE PANDAL IS SIMPLE BUT BEAUTIFUL. DAY LIGHT CLUB RANGIRKHARI: THE INNOVATIVE LOOKING IDOL IS A MUST SEE. Can I download … plssss.